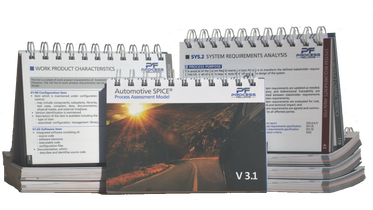 You will get an overview of the Process Assessment Model (PAM) "Automotive SPICE® v3.1" and its most important processes. On the one hand, it is about the requirements that the model places on the development, on the other hand examples for the implementation of the standard in the processes and workflows of a company are illustrated. Within this training you have the chance to exchange experiences and to develop ideas that go beyond the pure requirements of the standard. "Automotive SPICE® v3.1" is used to evaluate and improve development processes in the system and software environment. It is the automotive-specific derivation based on the requirements of ISO/IEC 330xx. It is a standard recommended by the VDA that is used to evaluate development processes and their implementation in projects at automotive manufacturers and suppliers. Each participant will receive a folder with the training documents as well a confirmation of participation. Price (plus VAT): EUR 1,600.00 p.p. Price (plus VAT): USD 1,800.00 p.p.